Fashion has long been international. Still, there are regional variations, especially in the past when fashion news didn't spread as quickly, and new clothes were less affordable than today - that's how "folk costumes" came to be. On this page I focus on anything dress-related that I percieve to be specifically Swedish. 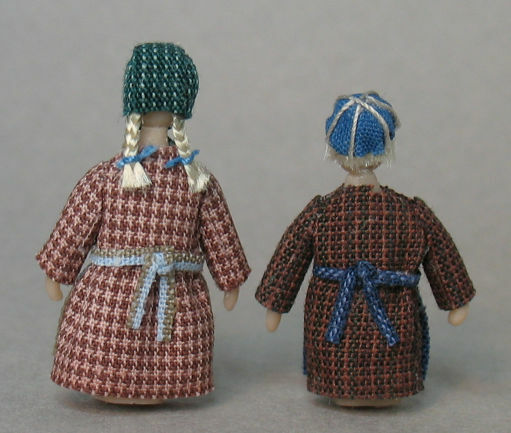 My non-Swedish dolls are on the European fashion page. 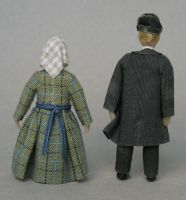 All my female dolls with floor-lenght skirts have a solid base from the waist down, not legs. 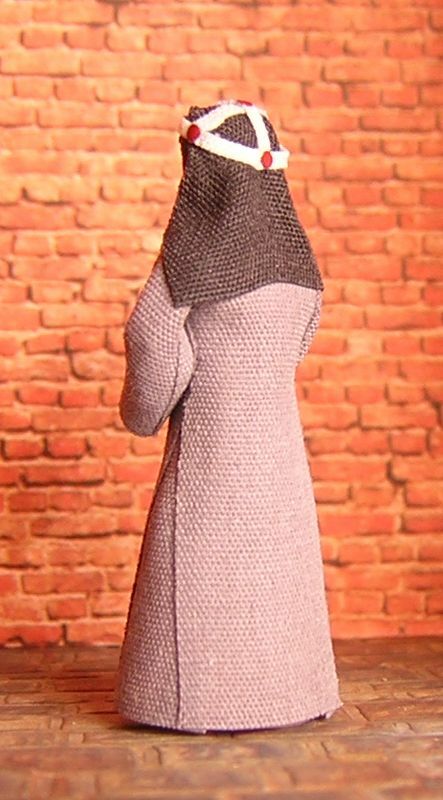 I think this approach has several advantages - I don't have to make shoes, they can stand without support, and the base helps giving the skirt the correct shape. The method I use for creating a female doll's body was described in Little Enough News volume 3, issue 3. Then I proceed to dress them using cotton or silk fabrics. These couples represent the 10th century. Only fragments of Viking garments have survived so we can't be absolutely sure what the outfits looked like; these are my interpretations of the information I've found. The big tortoise brooches are characteristic of the era. Saint Birgitta, the only Swedish saint, was born in Sweden in the early 1300s. She got married to the son of a knight when she was only 13, and had 8 children before she was widowed. She devoted the rest of her life to the church, writing down her visions and prophesies. Eventually she went to Rome to apply to the pope for permission to found a new monastic order, which she was granted in 1370 (though as a branch of the Augustinian order). She died in 1373, and was canonized in 1391. She had chosen Vadstena in Sweden as the site for her convent, and made up plans for the monastic church (still standing in Vadstena). The first Birgittine (or Bridgettine) nuns and monks moved in there in 1384. 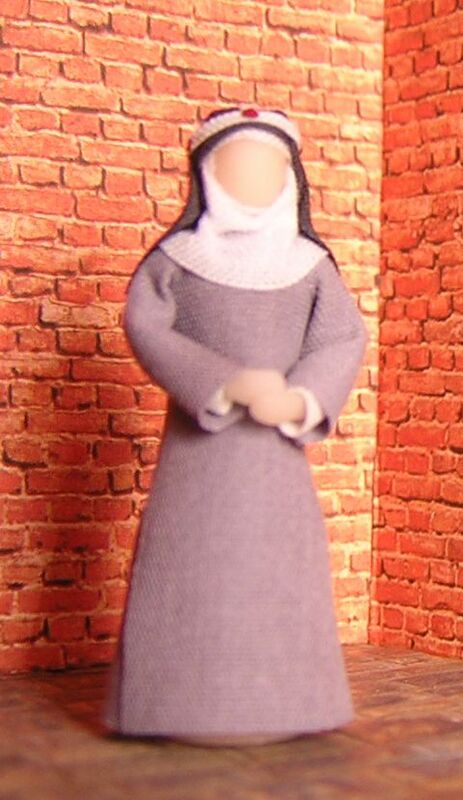 She also specified what the nuns and monks were to wear. The nuns' "crowns" are unique for the Birgittine order; they're made from white fabric strips with five red circles symbolizing Christ's five wounds. 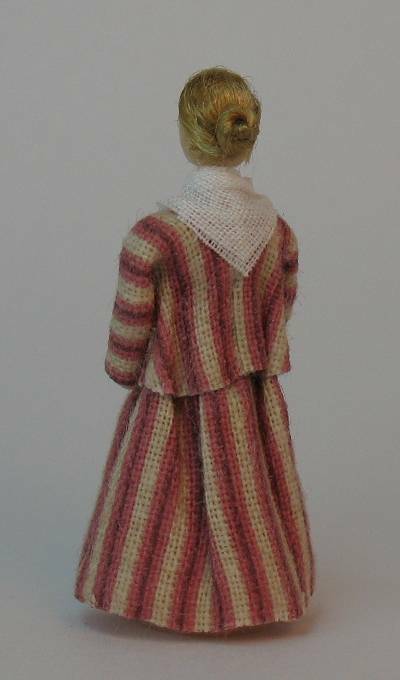 A skirt and loose-fitting jacket (matching or not) were often worn by townswomen in the 2nd half of the 18th century, and upper-class women used it for comfortable home wear. It was especially well suited for maternity wear. In English, the jacket seems to be called a short gown or casaque. I'm pretty sure that she ought to wear some type of headdress (both indoors and outdoors) but I haven't added one as I don't know what it should look like. 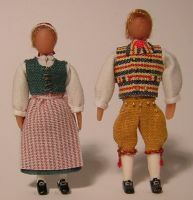 Folk costumes can be described as traditional rural fashions that varied from region to region. They preserve traits from much older fashions, often adding influences from more recent trends, and sometimes developing unique accents that are unlike anything seen elsewhere. 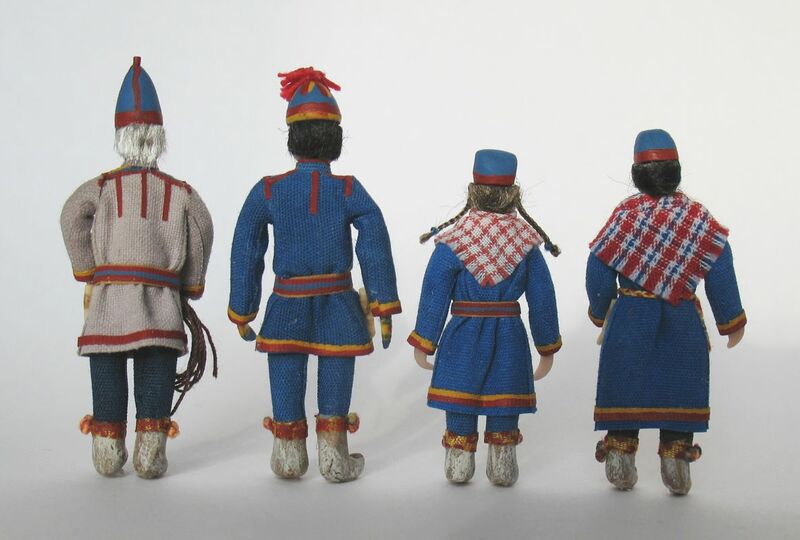 In coastal areas and near the cities, folk costumes fell into disuse around 1800, but in the countryside where communications weren't as good, they lingered for another 50 years or so. 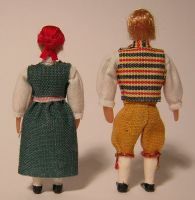 Today's folk costumes mirror the "Sunday best" of the past (the everyday clothes were used until worn out, and thus rarely preserved). So, folk costume is acceptable wear on any formal party today, even at the Nobel Banquet where everyone else wears evening gown or tails. The general designs of the clothes for everyday use vs. special occasions were probably similar, though expensive bought materials or elaborate embellishments wouldn't have been lavished on everyday clothes. And you couldn't just combine any garments you liked for a special occasion, as there were lots and lots of local rules about how to dress. E.g., apron colors varied according to the occasion, following strict unwritten rules that varied between different communities. In some places a certain color of apron or skirt might be reserved for married women and another for maidens. Married women had their head covered at all times. And so on. 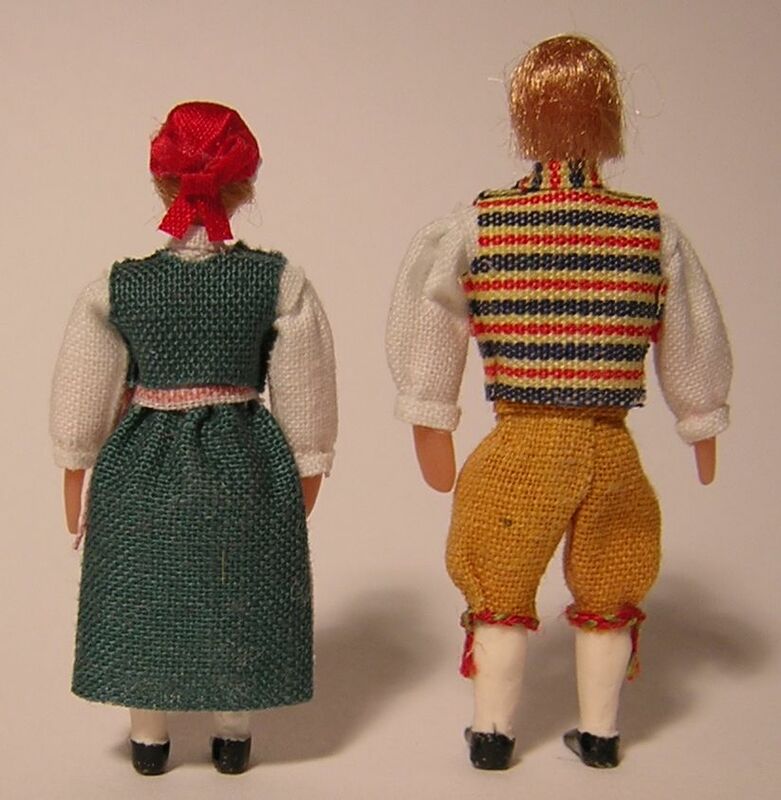 This girl and boy wear children's clothes that were in use in the countryside at least until the mid-19th century. 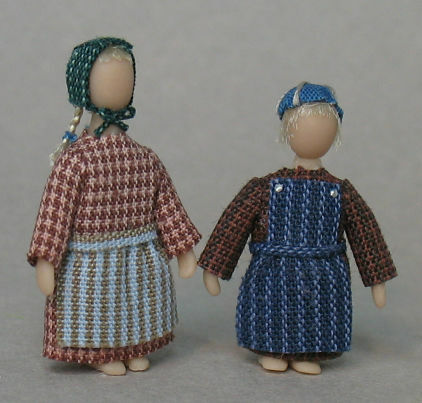 At first sight, they look pretty similar in their dresses and aprons, but actually all of their garments are cut differently. So boys and girls could easily be told apart. The skirt of the girl's dress is gathered to the bodice, and she wears a waist apron, like women did. She's wearing a girl's bonnet made up of a rectangle running front/back and two side pieces. The boy wears a frock, which has no waist seam. His apron has a bib, like men's leather aprons do. The top corners of the bib are buttoned onto the frock. A boy's cap was always made up of wedge shaped pieces, usually six of them. As toddlers they wouldn't wear diapers or anything else underneath, so both boys and girls could easily go pee when they needed, without help. They'd switch into more grown-up clothes around the age of seven, when they could manage buttons and generally were considered mature enough. For a not-so-bright boy the change in clothing would've been delayed. At this point, folk costume had long been abandoned in all but the most conservative areas. But that didn't mean people adopted current fashion straight off. You wouldn't see the average farmer sport a black three-piece suit and a top hat, or his wife a tiered dress! The woman's dress fabric has a large plaid pattern, this was very popular at the time as it suggested the look of a tired skirt, without all the extra fabric. There could be as little as three pattern repeats from waist to hem. Most of the skirt's fullness is in the back. The bodice is sewn to the skirt, and has lines converging at the center front, suggesting a pointed bodice. She doesn't wear a crinoline, but she may have put on an extra skirt underneath for added fullness. In a few years time, her dresses will probably be much more colorful - scientists discovered several synthetic dyes in the 1860s, which resulted in lots of bright dyes being available at low cost. Up until around this time, farmer women considered an apron to be compulsory even when dressing up. Of course they had different aprons for different occasions, their Sunday apron(s) often being made of calico or other bought fabric, rather than the everyday homewoven stripe. Headwear was also a must for women. Now, headscarves were used for all occasions. A woman would have a few to choose between, cotton for everyday wear and silk for dressing up. At this time, hats were worn only by upper-class ladies and townswomen. In the countryside they'd be worn by ladies on the manor and possibly by a courageous daughter of the local vicar. Anyone else trying to wear a hat would be regarded as most conceited, and certainly not knowing her place! A farmer's waistcoat was often sewn from an oddment of striped or plaid fabric, while in fashionable wear the waistcoat would be black like the rest of the three-piece suit. His necktie is a folded up square of calico or silk. The trousers have a fall-front opening, as the fly wasn't yet common in the countryside. He could've worn some type of jacket instead of a coat, but I couldn't find any pics of what it would've looked like so I went with the coat. When working, he might don a bibbed leather apron for protection. His brimmed leather cap, slightly worn at the edges, is a type of cap that had been used by Swedish military earlier in the century, then eventually became popular as dress-up headwear among farmers, and finally for everyday use. It was convenient as it could be folded flat when not in use. The brim should be tilted down rather than up, I just couldn't get it to behave the way I wanted. The Saami are native to northern Sweden and adjoining parts of Norway, Finland and Russia - an area known as Lapland. 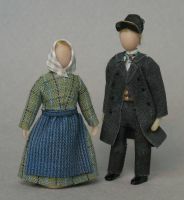 They used traditional costumes into the mid-20th century. Today, many Saami still use traditional style clothes for their Sunday best. Saami clothes styles vary between different areas. In Sweden, there are about ten areas that each have their own style. This family is from Jukkasjärvi, and their clothes date to around 1900. Broadcloth and rough homespun have been used for Saami clothes for centuries, broadcloth being reserved for the best clothes. 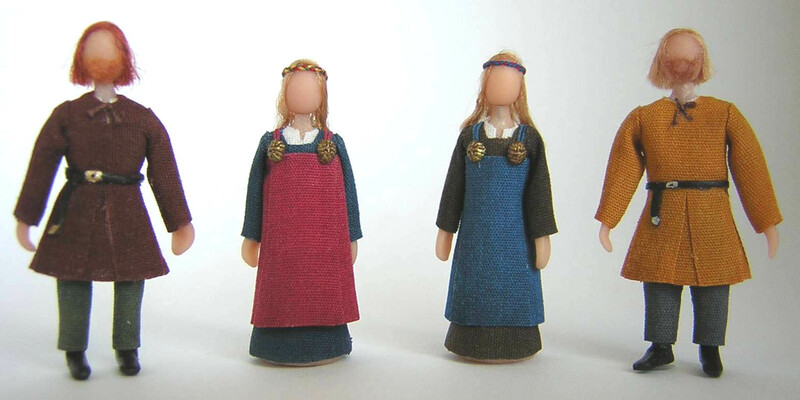 The cut of the clothes dates back to earlier times, when they were made of reindeer hides, with or without fur (to me, they look similar to Medieval tunics). Furs were used for outer garments. 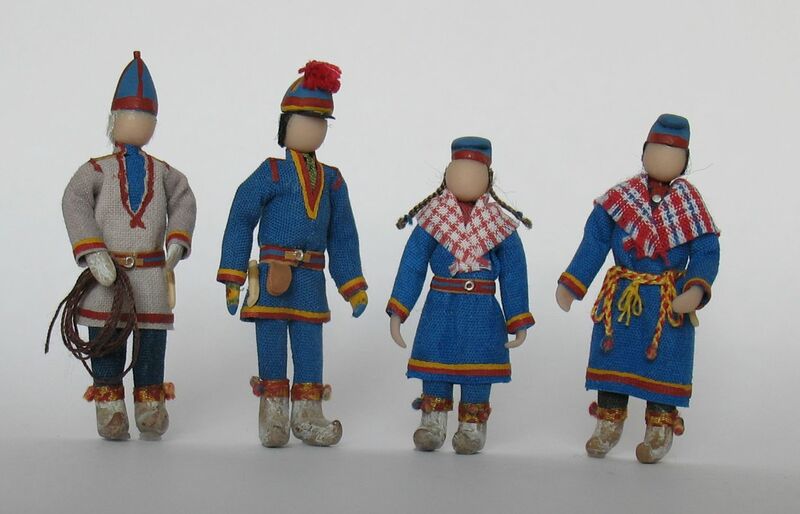 Fabric and scarves were bought from merchants or settlers, as the nomad Saami didn't produce fabrics. Knitted mittens and socks were acquired by bartering with settlers (grandpa in his homespun tunic wears reindeer hide mittens). Blue has become the most popular color for clothes, though others are used as well. The trim is made from strips of broadcloth, and may use combinations of yellow, red, blue and green. Trim was used on furs as well. There are regional variations in headgear, trim, and the cut of the clothes. All ribbons are made by Saami women themselves, using a range of techniques. Shoes were home made, sewn from reindeer hide. Around 1900, there was a kind of paradox in how pepole viewed folk costumes. In the countryside everyone had stopped wearing them, and instead aspired to dress like the middle class. On the other hand, the upper classes were becoming interested in the "exotic-looking" folk costumes from various parts of Sweden, wearing them for outings and generally using them as dressing up costumes, quite ignorant of how they'd originally been worn. 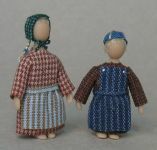 A woman named Märta Jörgensen noticed that folk costumes were often more hygenic and practical than fashionable clothes were. She founded a reform dress society with the purpose to "achieve an emancipation from the tyrannic influence that foreign fashion has over the female dress"!!! She figured that if she could get upper class women to set a good example by returning to traditional type costumes, then the lower classes would also follow suit. She recommended that women should aim for how people in their own area had used to dress rather than picking any folk costume they fancied, and that they should take care to learn how that costume should be put on properly (this holds true today too). Last but not least, with the help of some artists she designed a reform dress in folk costume style to be used by those who came from areas that didn't have preserved folk costumes. She used blue and yellow, the colors of the Swedish flag, and embellished it with embroidered flowers in an Art Nouveau flavor (she also designed another color combination where the bodice and the embroidered stripe on the apron are in red). But, her reform dress never caught on. In the 1970s the reform dress started drawing renewed interest, and since 1983 it has been used by some people as an alternative to traditional Swedish folk costumes. Nowadays, you can see it pretty much anywhere folk costumes are used, especially at Midsummer and National Day festivities. If you want to read more about the Swedish "National Costume" or about Swedish folk costumes, please see my FAQ for links. In case you wonder how I did the flower design on the bodice and apron, it's just craft paint but I think it looks good enough. Using a 10/0 liner brush helped in getting the long lines on the bodice look neat. I painted everything before I glued the pieces in place, so I could easily start over if I wasn't happy with the results. On Lucia Day (December 13th), a daughter of the family rises at dawn, dresses in a white chemise with red sash and puts a crown of candles on her head. She then wakes the family members with singing and a traditional Lucia Day breakfast. Santa Lucia always offers saffron buns decorated with raisins, and also gingerbread - see the closeup picture below. 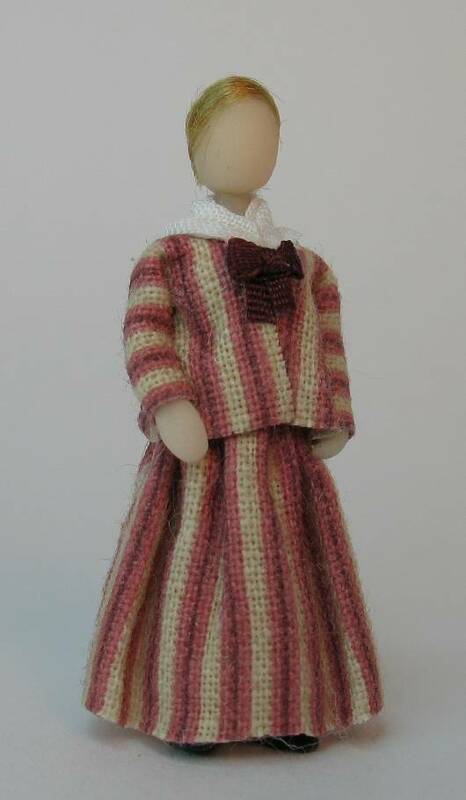 (Doll in the collection of Marilyn Nielsen). Lucia Day was originally celebrated in remembrance of the 4th century Sicilian saint Lucia. There's evidence of this custom in Sweden at least since the 18th century, but at that time it was a regional tradition in manor houses in Western Sweden. 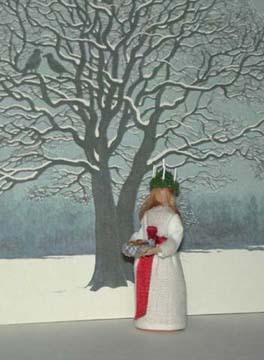 In the late 19th and early 20th century, a newly awakened interest in folk traditions made the Lucia celebrations increasingly popular throughout Sweden.